We are a team of expert and highly experienced roofers who will be able to fulfil all of your industrial roofing needs to the highest standard. Based in Bridgend, we are delighted to hear from clients throughout Wales. If you would like a commercial roofing project completed to the very highest standard in a very time efficient manner, do not hesitate to ask us for a quote or to get in touch to find out more about the types of industrial roofing solutions that we provide. We have over three decades of experience in the field of industrial roofing and we can deal with a variety of issues in a timely and highly professional way. One of our key areas of expertise is providing general roof repairs and maintenance services. If you notice a problem with your roof, it is best to call us out as soon as possible to rectify it immediately. We can also perform a complete re roof for a commercial building, or provide a new roof for your newly built business premises. In addition, we specialise in all aspects of leadwork, panel fitting and tiling. 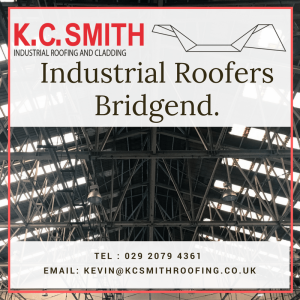 In short, no matter what type of roof you have (or want to have), we are the ideal industrial roofers in Bridgend for you. Whether you would like your roof repaired or a whole new roof installed, you can always count on us to guarantee you a top quality job. A roof can make or break the aesthetic of a commercial building, and you can always trust us to do a great job. Let us make your building a joy to work in. As well as Bridgend, we are also able to carry out roofing services in Cardiff and Newport. Call us on 029 2079 4361 or 07976 763196 with any queries. Alternatively, please send an email enquiry and we will get back in touch as quickly as we can.